04/06/2018 - The Internal Revenue Service (SRI) of Ecuador and the Global Forum Secretariat held a joint consultative workshop on the implementation of the Common Reporting Standard with the financial services sector in Quito on 29-31 May 2018. The workshop was organised in co-operation with the Inter-American Center of Tax Administrations (CIAT). Ecuador joined the Global Forum in May 2017 and this visit is part of their induction programme. 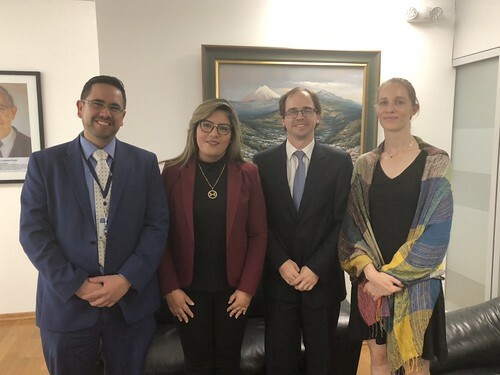 Kaelen Onusko and Jose Mejia, from the Global Forum Secretariat, met with the SRI Director-General, Marisol Paulina Andrade Hernández who reaffirmed the SRI commitment to implement Global Forum standards. Meetings were also organised with SRI officials and officials from the financial supervisory entities as well as a consultative meeting with the Ecuadorian Financial Industry. Ecuador has undergone a preliminary assessment of its capacity to implement the AEOI Standard and technical assistance is being offered to support implementation in collaboration with other international organizations and member countries. The assistance provided during this mission is aimed at ensuring that Ecuador can pass the relevant legislation to implement AEOI. Ecuador is expected to issue an official commitment to implement the Common Reporting Standard in the near future and to indicate a specific timeline to commence exchanges under the standard.